Whether a music lover or just someone who enjoys live art, the “Pat Cave” at Pat’s Endangered Species offers an intimate venue for both audience and artist. On Friday, Pat’s concert series will continue with Amy Rigby, an American singer and songwriter, performing at the Delaware record store located at 11 W. Winter St.
Rigby’s tour will make the stop at Pat’s before heading east to New York, New Jersey, Massachusetts, and then overseas to the United Kingdom and Sweden in May. After playing in bands “The Shams” and “Last Roundup” in the 1980s and early 90s, Rigby released her first solo album — “Diary of a Mod Housewife” — in 1996. From there, Rigby released six more solo albums and three with fellow artist and husband, Wreckless Eric. Her newest album, titled “The Old Guys,” was released last year and marks her first solo album in more than 12 years. Rigby said real-life experiences are a big inspiration for her, whether those experiences be from her own life or those around her. Asked about her music style and inspirations, she said they are made up of a variety of genres. She added she is a big fan of Bob Dylan, who Rigby said “encompasses everything” for her. Rigby went on to say that save for jazz or classical music, which she doesn’t have experience in, she enjoys and draws from almost all types of music. While some of her lyrics might seem to play more toward female listeners, Rigby said she often tends to play in front of more men than women. However, she said that when women hear her music, they are able to really relate to the songs. Rigby also enjoys working humor into her shows, whether that be from some of the lyrics of her songs or joking around on stage. She said it’s a shame there is often an existing stigma that suggests if the artist doesn’t take themselves overly serious, neither will anyone else. Friday won’t mark the first time Rigby has played in a venue owned by Patrick Bailey, owner of Pat’s Endangered Species. After originally selling his Delaware record store in 1997, Bailey moved to Montana where he opened another store and once had Rigby perform. Rigby said that show always sticks out in her mind as it is the only show she has ever played in Montana. But Rigby, who was raised in Pittsburgh and lived for a short time in Cleveland, said she enjoys playing in Ohio, and when Bailey reached out to her about playing in Delaware, she was happy to do so. She added that one of her favorite writers and inspirations — Erma Bombeck — was originally from Ohio. 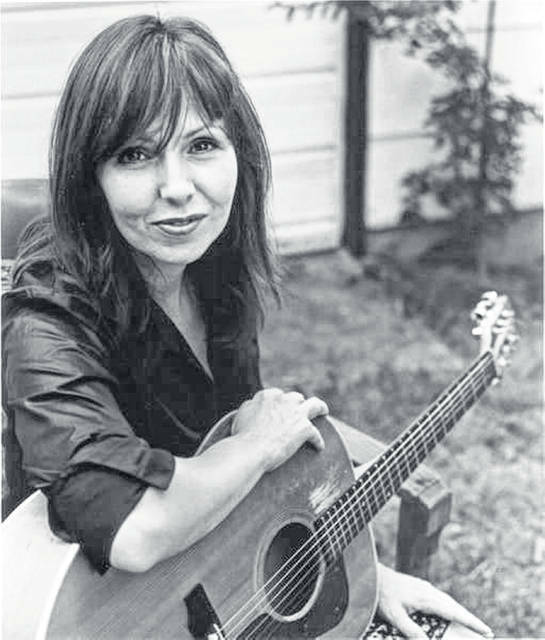 Bombeck hailed from Dayton and was known for her columns that described suburban home life, similar to many of the songs Rigby has written. While Rigby said it has been a big effort to get to Delaware for a show, she is excited about it and appreciates everyone who will share the evening with her. Tickets can be purchased at Pat’s or by calling 740-417-4776. The show will begin at 8 p.m. with doors opening at 7:30 p.m.
To learn more about Rigby and her music, visit her website at www.amyrigby.com.